The Basilica of Begona is a famous basilica in the Spanish city of Bilbao. Dedicated to the patron saint of Biscay, the Basilica of Begona is a magnificent remnant of 16th century Gothic styled architecture in Spain. What is remarkable about the Basilica is that it took about a hundred years to build. That resulted in the union of different styles of architecture over the original Gothic design, something which gives the building a truly unique look. The Basilica was first opened in the 17th century, and has stood more or less the same except for some renovation in the 19th century. The main entrance of the building was built sometime in the 16th century, in the shape of a glorious arch that was reminiscent of the works of Spanish architect Gil de Hontañón. The dizzying clock tower atop the Basilica has an incredible 24 bells, with the heaviest one weighing a tonne. The Basilica is as famous for its architecture as it is for the view of Bilbao from its steps. While climbing up, visitors can enjoy an incredible panoramic view of the entire city. On 15th August, the Assumption of Mary & 11th October, the day of Our Lady Begona, thousands of pilgrims take to the streets outside at night in honour of the patron saint of Bilbao. It is an age old custom for sailors on the river nearby to salute the Basilica at first sight as they sail into the city. The Basilica of Begona is one of the most iconic landmarks of Bilbao, due to the history behind it, the reverence of the locals, and of course, its immaculate design. However, it doesn’t take an architect to appreciate just how stunning the Basilica looks, and that makes it a must for every member of the family. It is quite a walk up the stairs to the Church, something visitors with heart ailments must be wary of. There is a lift available at the bottom of the stairs. However, the lift is quite cramped. Alternately, you could take the lift from the metro station nearby which is much bigger. There is no parking available near the Basilica, and the closest parking spot is at the bottom of the stairs. It is preferable that you take the metro, mainly due to the direct lift to the Basilica. There is daily mass at the Basilica in mornings and evenings. While visitors are allowed any time of day, refrain from taking pictures while the mass is in progress. Daily mass begins at 9 am. How popular is Basilica Of Begona? 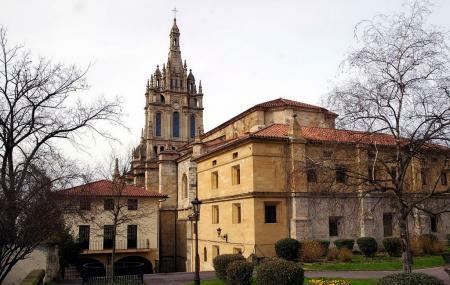 People normally club together Church Of San Anton and Plaza Nueva while planning their visit to Basilica Of Begona.